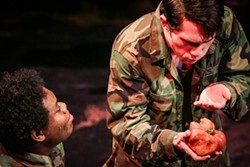 Isaiah Alexander (left) and William English III in Radioman. The Vietnam War shaped Eric Hollenbeck. American "missions" in Iraq, Afghanistan and countless others since have shaped generations of veterans who struggle to function in a world that has little or no understanding of their experiences. 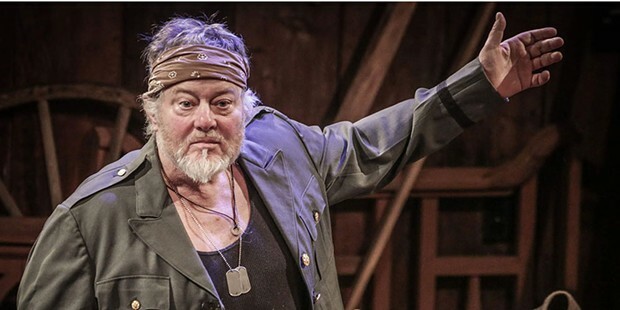 Radioman, currently playing at Dell'Arte's Carlo Theatre in Blue Lake, is a powerful tribute to those veterans that will stay with you long after the metaphorical curtain comes down. Radioman: Monologues from the Ones Who Made it Home, is a gripping portrayal of the challenges veterans face as they seek to reclaim the lives they once had. 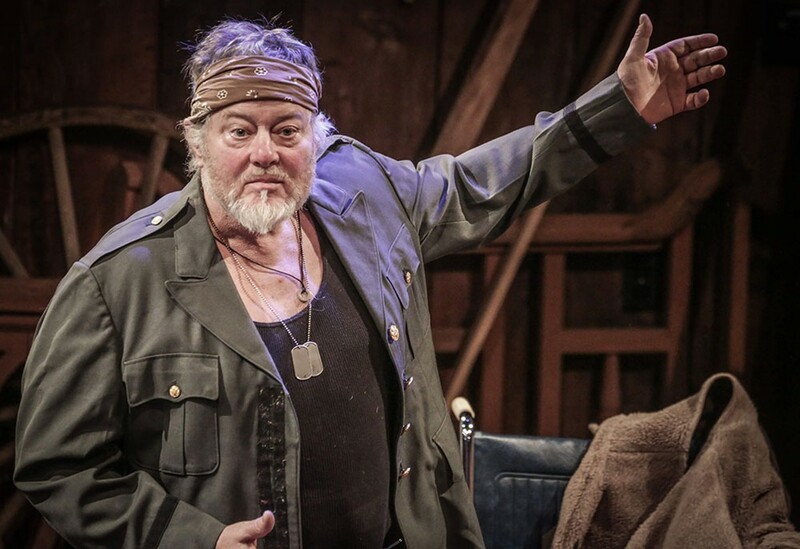 Created by playwright Jim McManus, Radioman is based on Uncle Sam's Tour Guide to Southeast Asia, the collection of poems Hollenbeck wrote as part of his own struggle to function in the "real" world, as well as extensive interviews with other veterans of multiple wars. At the center of everything is the radioman. The one with a 15-second life expectancy in a fire fight — in the A Shau Valley in Vietnam in 1968, radio was the only way to communicate so the 18-year-old boy with the 10-foot antenna was front and center in the enemy's line of fire. Hollenbeck was that terrified, cynical, old-before-his-time 18-year-old boy, played here by William English III in a performance that yoyos heartstoppingly between bravado and desperation. But that's not the only Hollenbeck you'll meet. This radioman made it home and eventually became the pipe-smoking, plaid shirt-wearing Hollenbeck that anyone who's ever visited The Blue Ox Millworks in Eureka will recognize instantly. In a pitch-perfect performance as the veteran radioman, Gary Sommers runs the gamut from dreamer to drinker, from lover to fighter, from father to foreman of the band of struggling vets he successfully leads through the Blue Ox's recreation of the Lincoln memorial hearse. 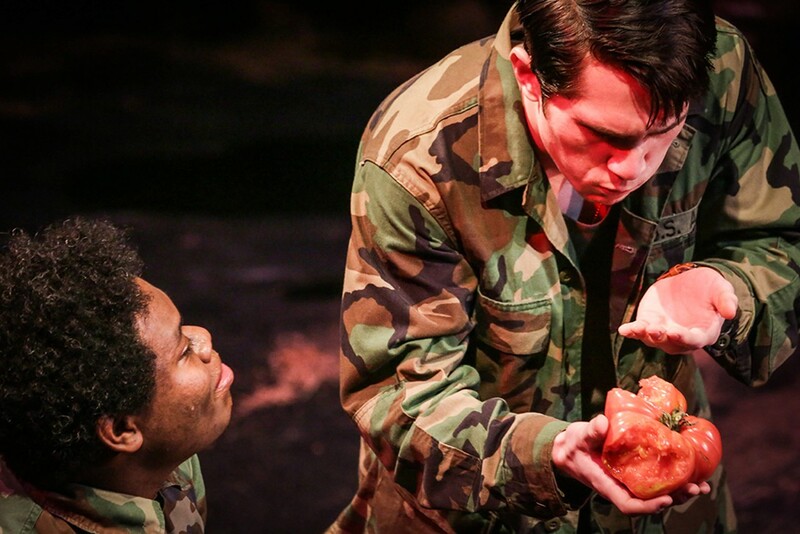 Weaving the fabric of the stories together around the radioman, the members of the ensemble cast transport us between the jungles of Vietnam, the deserts of Iraq, the wastelands of Afghanistan and the workshops at the Blue Ox. Different wars, different generations but the same barely contained anger and endless struggle to retain some vestige of humanity. The cast members each inhabit multiple characters as they battle on the ground and in their heads. Donald Forrest is scarily powerful as the veteran who's forced into psychotherapy, drinks to dull the pain, is the Olympic champion of three-year marriages and somehow manages to craft a perfect reproduction cartwheel. Sayda Trujillo is wound so tight you expect her to explode at any minute as she relives the lies and games we all use to avoid the pain of honesty. Elio Robles is chillingly convincing as the frustrated apprentice craftsman armed with power tools and a hair-trigger temper who left his innocence in Iraq. Kudzai Svenzo triumphantly carries the banner of black woman making it in a white man's army, overflowing with tenderness for the quadruple amputee she falls in love with in the VA hospital. Isaiah Alexander perfectly captures the boot-camp innocence of the raw recruit who doesn't even know where Vietnam is and Shawn Wagner flawlessly embodies the underclass that the Army is so good at turning into cannon fodder. And then there are the families, those who live with the aftermath of war, paying the price without ever having participated in the action. As the 12 year old who understands her father's mental torment with a maturity far beyond her years, Fiva Pulu skillfully manages a delicate balancing act between solicitous daughter and daddy's little princess. The adult daughter (Wagner) wistfully remembers the excitement her 5-year-old self felt going to the store with daddy for candy and beer. Zuzka Sabata oozes quiet strength as the wife who knows where to find her superhero behind the fog of PTSD. Her portrayal of an everyman soldier creates a connective tissue throughout the production. Radioman is co-directed with consummate skill by Dell'Arte's Producing Artistic Director Michael Fields and Roman Sanchez, recently named as one of six "theatre workers you should know" by American Theatre magazine. As scenographer, Lynnie Horrigan does an admirable job of creating a flexible canvas for the actors, as well as hunting out historically accurate costumes. Michael Foster delivers nuanced lighting that adeptly draws the audience into the veterans' world and Brian Post's sound design will have you believing you really are listening to '60s radio. Technical director James Hildebrandt and production manager Kaitlyn Samuel Rosin ensure smooth functioning of all the moving parts behind the scenes. Live theatre can take you places cinema can only aspire to. For those of us fortunate enough to have no direct experience of war, coming face to face with these veterans' 1,000-yard-stares will change your understanding of war forever. This production is a combination of fact and fiction and contains strong language. It is not appropriate for children. Note that Dell'Arte has scheduled an additional matinee on Saturday, Jan. 19 at 2 p.m. to meet the high demand for tickets to this production. Radioman continues Jan. 17-19 at 8 p.m. and on Saturday, Jan. 19 and Sunday, Jan. 20 at 2 p.m. Visit www.dellarte.com or call 668-5663. More border wall battles, this time between neighbors in Northcoast Repertory Theatre's comedy Native Gardens Jan. 18 through Feb. 10. 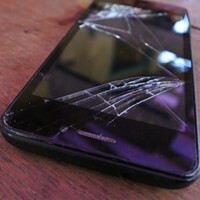 Call 442-6278 or visit www.ncrt.net. British farce livens up a haunted former brothel in Alan Ayckbourn's Taking Steps at Ferndale Repertory Theatre Jan. 24 through Feb. 17. Call 786-5483 or visit www.ferndalerep.org. Live radio/dinner show and Redwood Curtain fundraiser ZOUNDS! 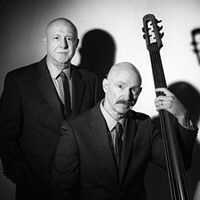 returns to the Sapphire Palace at Blue Lake Casino on Jan. 26 at 6 p.m. Call 443-7688 or visit www.redwoodcurtain.com.